Quick overview This Very Short Introduction explores the history of the 18th-century Enlightenment movement. Considering its intellectual commitments, Robertson then turns to their impact on society, and the ways in which Enlightenment thinkers sought to further the goal of human betterment, by promoting economic improvement and civil and political justice. A foundational moment in the history of modern European thought, the Enlightenment continues to be a reference point for philosophers, scholars and opinion-formers. To many it remains the inspiration of our commitments to the betterment of the human condition. To others, it represents the elevation of one set of European values to the world, many of whose peoples have quite different values. But what is the relationship between the historical Enlightenment and the idea of 'Enlightenment', and can these two understandings be reconciled? 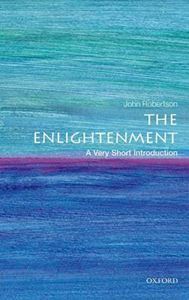 In this Very Short Introduction, John Robertson offers a concise historical introduction to the Enlightenment as an intellectual movement of eighteenth-century Europe. Discussing its intellectual achievements, he also explores how its supporters exploited new ways of communicating their ideas to a wider public, creating a new 'public sphere' for critical discussion of the moral, economic and political issues facing their societies. ABOUT THE SERIES: The Very Short Introductions series from Oxford University Press contains hundreds of titles in almost every subject area. These pocket-sized books are the perfect way to get ahead in a new subject quickly. Our expert authors combine facts, analysis, perspective, new ideas, and enthusiasm to make interesting and challenging topics highly readable.